The 4th Chantilly Arts & Elegance Richard Mille held on Sunday 10th September in the Chantilly Château domain fulfilled all its promises. Boosted by its first staging, which placed it firmly among the international benchmarks for concours d’élégance, the event continues to progress both in terms of visitors and in the richness of the cars entered for the different concours. Thus, 16 300 spectators (an increase of 20% compared to 2016) were attracted by the vehicles on show. Five cars were in contention for the Concours d’Elégance: the DS 7 Crossback Présidentiel, the Aston Martin Vanquish Zagato Volante, the McLaren 720 S, the Renault Trezor Concept and the Citroën CXperience Concept. The Best of Show was awarded to two winners: the Renault Trezor Concept (Couturier Balmain) and the Citroën CXperience Concept (Couturier: Yang Li). For the Concours d’Etat, the organiser Peter Auto decided to celebrate in its own way Ferrari’s 70th anniversary with the Le Mans 24 Hours as the main theme. From this unique exhibition, an exceptional car won the favours of the jury and the Best of Show for the post-war cars went to the Ferrari 250 Testa Rossa 58 (châssis #0728). Gathering four Type 57 Ss together in the same place was a feat in itself and it justified the awarding of three prizes for this class crowned by the Best of Show for the 1936 Bugatti Atlantic (châssis #57374). The first two editions placed the event among the benchmark international Concours d’Elégance, and the third show consolidated the same trend. 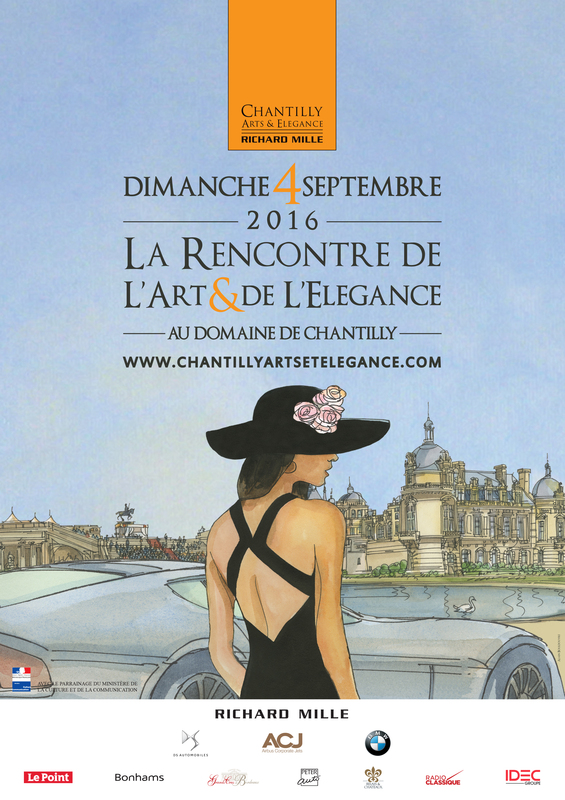 It was organised on Sunday 4th September and confirmed its status as the elegant rendezvous of the early autumn attracting some 13 500 visitors to the Chantilly domain, a stable figure compared to 2015. The number would certainly have been higher if the weather – cloudy skies and light rain in the morning – had been as clement as in previous years. There were eight concept cars in the running for the Concours d’Elégance. The Best of Show award went to the DS E-TENSE combined with a creation by Eymeric François. The Concours d’Etat attracted around one hundred exceptional cars from all over the world divided into 21 classes. The jury awarded the Best of Show to the 1938 Alfa Romeo 8C 2900B Lungo Berlinetta with coachwork by Touring belonging to American collector, John Shirley, entered in the class Pre-war beginnings of aerodynamics cars. Forty clubs made the trip to Chantilly bringing 800 cars that were on show in the domain. They were an integral part of the event and made a large contribution to the success of the big garden party to which the public was invited. Overall, the fans of motor cars, all generations combined, as well as families were attracted by the programme of the third staging of Chantilly Arts & Elégance Richard Mille, which celebrated the art de vivre and know-how à la française. The second Chantilly Arts & Elegance Richard Mille, which took place on Sunday 6th September, confirmed the success of last year’s event. 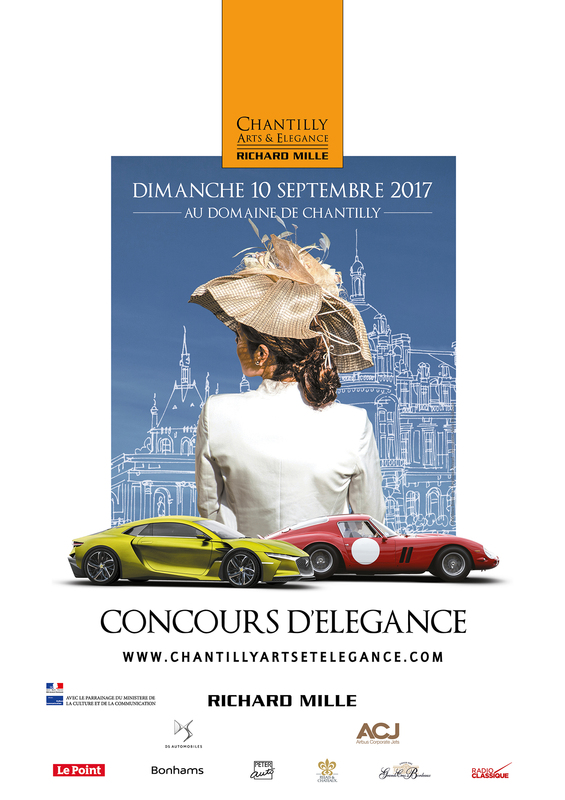 The Chantilly domain, an exceptional idyllic setting just right for such a concours, welcomed 13 500 visitors, a 35per cent increase compared to the first running in 2014. Motor car fans and families were attracted by the programme celebrating the art de vivre à la Francaise with numerous workshops and attractions specially organised for the occasion. The weather on Sunday was very pleasant and enthusiasts were able to feast their eyes on the 100 exceptional cars, which were all candidates for the Concours d’Etat award, the seven concept cars from manufacturers and designers accompanied by models representing the fashion house in the competition for the Concours d’Elegance prize, as well as the 40 clubs there to win the Grand Prix des Clubs. The Chantilly Arts & Elegance Richard Mille reviving the great French Concours d'Elegance tradition dating from the 1920s was awarded the prize for the best motor car event in 2014. This year it was sponsored by the Ministry of Culture and Communications. Yesterday (Sunday) it received the growing acclaim of the public, collectors from all over the world – with 850 cars present. 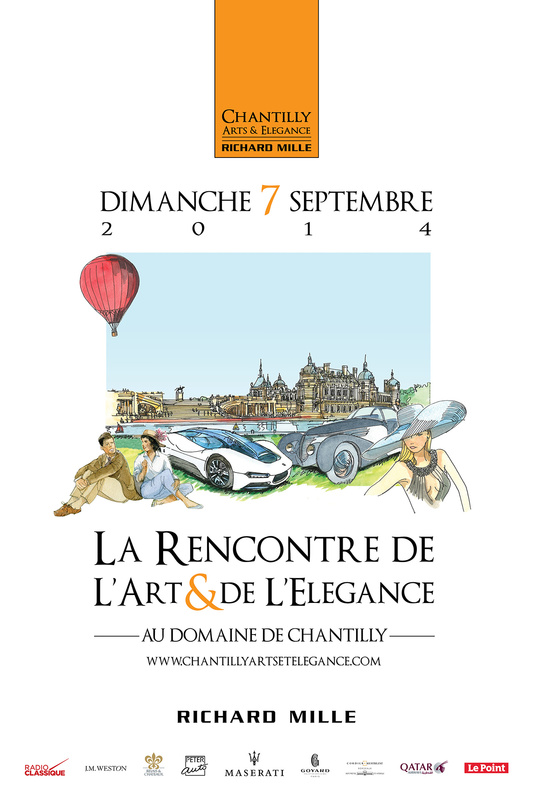 Chantilly Arts & Elegance Richard Mille is now firmly installed as the early September elegant rendezvous in France and beyond its frontiers: Europe, Asia, America... In just two meetings the event has confirmed its place among the blue riband international motor car concours. 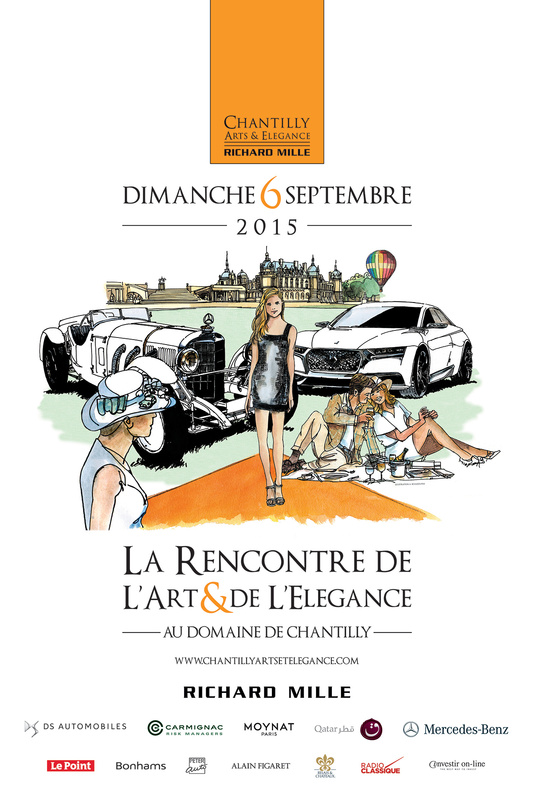 The first Chantilly Arts & Elegance Richard Mille was held on Sunday 7th September and fulfilled all its promise. This first rendezvous, the result of two years’ hard work by the organiser Peter Auto, which has built up its international reputation with two major events for historic motor cars – the Tour de France Auto Optic 2ooo and Le Mans Classic - celebrated the return to French soil of the Concours d’Elegance. This great national tradition dating from the 20s was revived on Sunday in the Le Nôtre gardens in the Chateau in Chantilly. On the programme was a parade of 10 concept cars from manufacturers accompanied by models dressed by the same number of haute couture houses. Three world premières took place: the Aston Martin Zagato, the DS Divine and the Peugeot Exalt (French version). There was also a European première the McLaren P1 GTR. The Concours d’Etat brought together some 100 exceptional cars from the greatest collections from all over the world divided up into ten classes. Finally, there was a third concours – the Clubs Grand Prix – which welcomed almost 500 cars and rewarded the best setting by a club in the context of the Déjeuner sur l’Herbe (see below the results of the different concours). Almost 10 000 spectators attended the first running of the Chantilly Arts & Elegance Richard Mille, which has immediately become part of that very elite circle of the most outstanding events of its type. Numerous workshops celebrating the French Art de Vivre and Savoir Faire were also very popular as were the various forms of entertainment for the general public.